I own over a hundred cookbooks, and yet still subscribe to several magazines containing recipes and visit food websites frequently. My usual route through a magazine is read and tear, read and tear, saving those torn-out recipes to (eventually) file in one of my recipe binders and (someday) try. When I find good-looking recipes on line, I email the link to myself (and often, too, my sister and mom) and save it in a “recipes” folder on my computer. It is rare that a recipe arrives in my inbox and I just make it, right then. But Friday night, it was less than an hour from “oh, that looks good” to cookies coming out of the oven — a new land speed record for me. Chalk it up to having a well-stocked pantry, two kids as busily occupied by LEGO as Lisa’s, a recent stroll past Paulette, San Francisco’s new source for Parisian macaroons, and one really easy recipe. Don’t be put off by the need to separate eggs; it’s only two, and you can keep the yolks to throw into an omelette the next day. Beat the egg whites until frothy, then gradually add the sugar and salt, continuing to beat until just stiff. Whisk in vanilla and flour until well combined, then fold in coconut. Pour the batter onto a baking pan lined with parchment and spread it with an off-set spatula so it is about 1/4” thick. Bake until the top is toasted and dry to touch, about 30 minutes. While macaroon is still warm, cut into rectangular pieces. Let cool until room temperature and then spread nutella on the cookies. 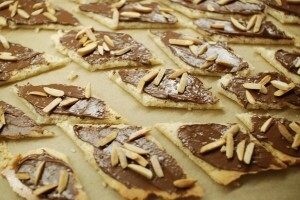 Sprinkle toasted almonds on top of the nutella, then finish with a sprinkle of sea salt. « LEGO Cake	» Thanksgiving Without An Oven?